Everyone knows that baking is a whole different story from just regular cooking. Baking is a separate monster that's a lot more difficult to take on. In baking you must be accurate when it comes to measurements and it's a lot less forgiving simply because you cannot taste and adjust throughout the baking process - you only have 1 shot at achieving perfection. That seems to be the nature of the beast. If you want to start baking, I highly recommend trying your hand at blueberry muffins for practice. America's Test Kitchen's recipe for best blueberry muffins (season 10, episode 3: Best Weekend Breakfast) is what got me into baking because it was so easy as the video shows. I imagine baking a cake, making homemade bread, or making your own pie crust could prove to be more complicated than a muffin. 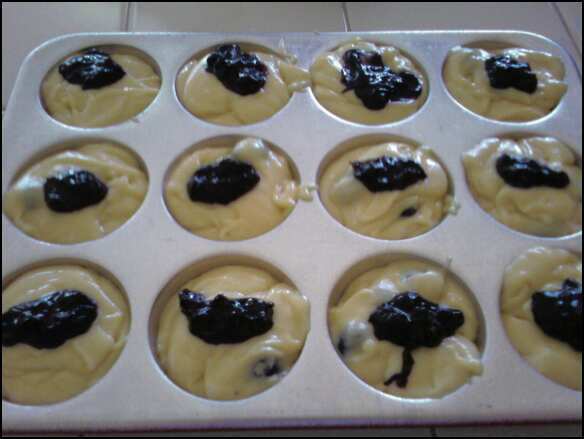 What makes this recipe simple is that you just have to make the blueberry jam, mix the dry ingredients in 1 bowl, mix the wet ingredients (plus the sugar) in another bowl, combine the wet and dry ingredients to get your batter, and fill the muffin tray with the batter and jam. Yes, it is that simple. What I also like about this recipe other than the simplicity of it is the fresh blueberry jam that you make yourself. The jam is good enough to spread on toast if you so desire. 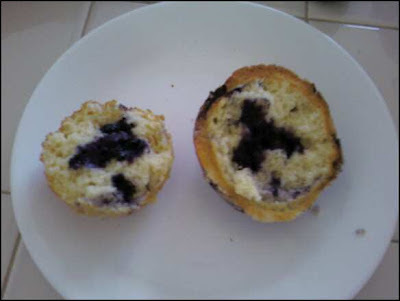 It just makes the muffin all the more better to be using fresh blueberries and it doesn't make it too sweet either. The recipe also says to use 1 cup of blueberries for your jam and another 1 cup to add to your batter. I much prefer to use both cups of blueberries for the jam. I've made these muffins several times, and I just didn't like biting into the muffin and having a whole blueberry in my mouthful of muffin. It's more of a matter of texture than taste since I prefer a more consistent texture with my muffins, so I like to use more jam instead of whole blueberries. Using whole blueberries in your batter will make doing the figure-8 swirl meant to mix the jam a lot more challenging since whole blueberries would fill up the muffin cup in your tray thereby restricting movement. Since I had more jam, I would layer it with the batter: working my way from the bottom of the muffin cup to the top, I would put a teaspoon of batter, a teaspoon of jam, a teaspoon of batter, a teaspoon of jam, a teaspoon of batter, and finally the lemon zest and sugar to top it off. The lemon zest and sugar sprinkled on the top of the muffins is also a favorite of mine with this recipe. The lemon zest adds a flavor complementing the blueberries that really isn't too lemony. Definitely cut down on the amount of sugar for the tops - 1/3 of a cup of sugar is just way too much to just sprinkle on top. I wonder if there's a way you could convert these muffins into gluten free blueberry muffins. If so, that'd be great. You might even want to try using blackberries or even cranberries instead. 1 tsp of sugar was enough for the topping instead of 1/3 cup sugar for the topping. The topping is optional. If you don't have lemon zest, your muffins will still turn out fine without the lemon sugar topping. I used both cups of blueberries for the jam. The jam will take about 9-10 minutes. While making the jam (stirring occasionally of course), you can combine the dry ingredients in one bowl and the wet ingredients (plus the sugar) in another bowl. By the time the jam is done, both bowls are ready to use and be combined to make the batter. I used a 3x4 muffin or cupcake tray for a total of 12 muffins. Use a pan that is preferably nonstick, so that your yummy muffins can be easily removed. 1. FOR THE TOPPING: Stir together sugar and lemon zest in small bowl until combined; set aside. 2. FOR THE MUFFINS: Adjust oven rack to upper-middle position and heat oven to 425 degrees. Spray standard muffin tin with nonstick cooking spray. Bring 1 cup blueberries [I used all 2 cups of blueberries] and 1 tsp sugar to simmer in small saucepan over medium heat. Cook, mashing berries with spoon several times and stirring frequently, until berries have broken down and mixture is thickened and reduced to ¼ cup, about 6 minutes [it'll take a bit longer, more like 9 minutes]. Transfer to small bowl and cool to room temperature, 10 to 15 mins. 4. Use ice cream scoop or large spoon to divide batter equally among prepared muffin cups (batter should completely fill cups and mound slightly). Spoon teaspoon of cooked berry mixture into center of each mound of batter. Using chopstick or skewer, gently swirl berry filling into batter using figure-eight motion. Sprinkle lemon sugar evenly over muffins. 5. Bake until muffin tops are golden and just firm, 17 to 19 minutes [19 minutes in the oven was enough time to fully bake the muffins], rotating muffin tin from front to back halfway through baking time. Cool muffins in muffin tin for 5 minutes, then transfer to wire rack and cool 5 minutes before serving. If you enjoyed America's Test Kitchen's blueberry muffins, then you might also want to take a look at their rendition of blueberry scones. Hi @Anonymous, yes indeed these muffins do come out very moist. I hope they turn out well for you. Good luck and enjoy! Is the time and temperature the same for 2 x 3 (6) jumbo muffins? I have found the center to be not set when 19 minutes has past @ 425 degrees. Hi @Anonymous, the time won't be the same if you were to make six jumbo muffins. 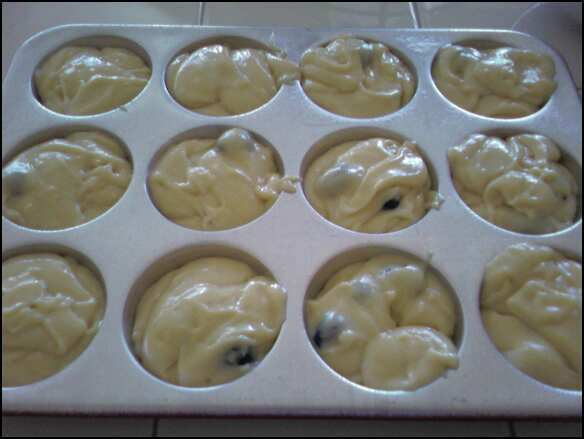 The recipe for America's Test Kitchen Blueberry Muffins is for twelve muffins, so making six jumbo muffins using the same amount of ingredients will definitely increase the baking time. Because each muffin is now double the size, the jumbo muffin needs more time in the oven. I haven't made jumbo muffins, so I can't say how much time it'll take. You could first try doing 25 minutes and do the toothpick test to see if the toothpick comes out clean. If not, then try another 5 minutes and adjust accordingly. I hope this helps. Good luck! These are absolutely DELICIOUS! I've been on a quest to find the BEST blueberry muffins. I'm testing 7 different recipes and so far I've made four of them and these are my favorite (I am also using friends as guinea pigs for taste-testing and this recipe is everyone's winner)! I followed the recipe exactly except that the cup of cooked blueberries was added ONLY in the middle of each muffin - not on top (cuz personally I don't like a purple muffin - just preference). Yum! Thank you! 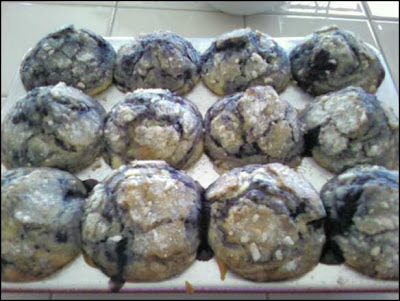 I'm glad you're loving America's Test Kitchen recipe for Best Blueberry muffins, @Lucky&Me! Yes, your friends are definitely lucky to be your test subjects especially when they get to eat something delicious and baked in the oven.